The best email ever written. 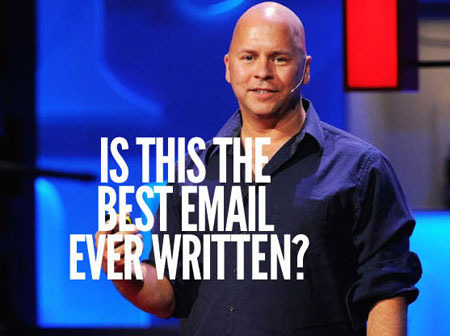 In 1998, entrepreneur and former circus ring leader, Derek Sivers founded CD Baby which became the world’s largest online distributor of independent music. When someone bought a CD, Derek set up a short automatic email that thanked them for their purchase and offered a support email and phone number if they had any questions or issues. Then one day, on a whim, Derek ‘massaged’ his message to customers into something that many marketing people say is the best email ever written. Derek says he wrote the email because his mission in business was to make people smile. I think he succeeded brilliantly. Ten years later, Derek sold CD Baby for a reported $22 Million. I learned about this email and Derek’s story by listening to a Podcast by one of my favourite writers & podcasters Tim Ferriss. Tim wrote a book called ‘The 4 Hour Work Week’ which became my manual for successfully moving to Canada while still being able to maintain my businesses in Australia. It’s an amazing and inspiring read. Anyway, back to Derek’s email. There’s nothing wrong with having a little fun and making people smile. Okay, Derek is a gifted writer, but he also had the courage to do something completely different to what people would expect. He just wrote it as he would say it. He let his personality loose on that email and real and lasting success followed. Here is Tim’s interview with Derek. He’s a great guy and I know you’ll enjoy it. Can I suggest you sign up to get Tim’s regular podcasts? He has some great guests and I think he’s one of the best interviewers going around because he doesn’t race, he doesn’t talk over his guests and he thoroughly researches each guest to ask excellent questions. When it comes to marketing, Tim is my benchmark and the inspiration for my own podcast. ← How to make sure our interview is AWESOME!